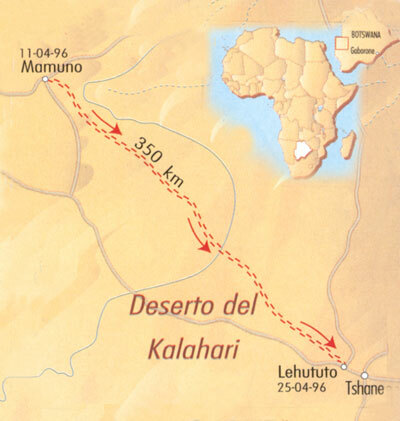 The Kalahari desert is twice as big as Italy, spread between Namibia and Botswana in the austral hemisphere on the south of Africa. 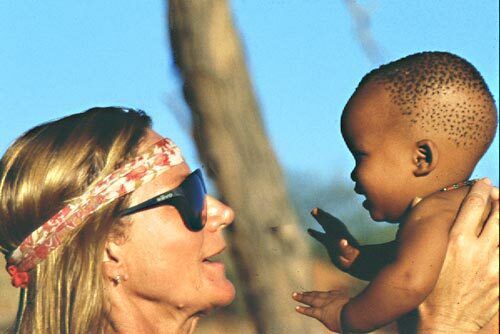 This desert is the home of the Bushmen who are the only population able to survive in one of the driest regions of the earth. Thanks to a very short rain season it a bush desert, populated by numerous animals: from venomous insects, deadly snakes, gazelles, ostrich, lions and hyenas. Every encounter is possible and may become dangerous. 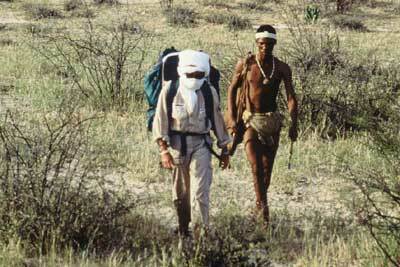 Carla decided to try crossing on foot and alone: The purpose of it was to prove that a person who was not born in the desert could adapt and live like the populations there. 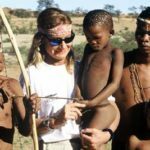 She was accepted by a small Bushmen community, which in a few days period, taught her the basic knowledge of the surviving in extreme conditions. 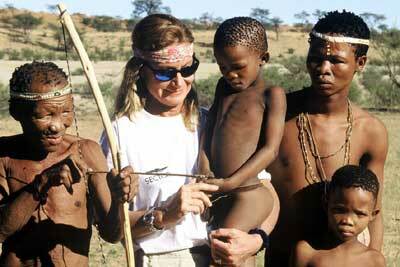 It was an experience that changed her life and that left a strong trace in her explorer’s soul. 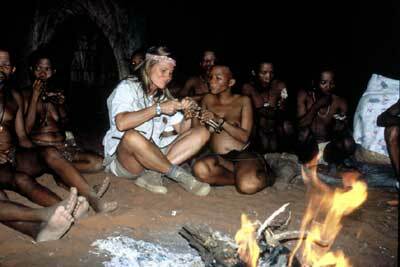 “Take from the Kalahari only what you need to live. Respect every animal that you will encounter and you will see that you will be respected back…. 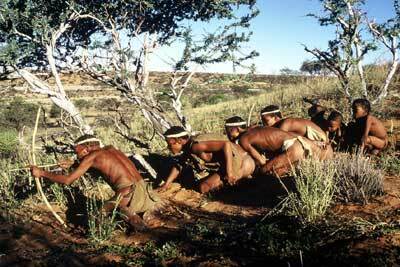 It will be a very hard challenge but the Bushmen will always guide you with their thoughts and will help you. 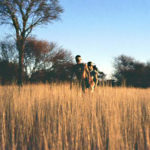 The Kalahari is not your enemy: accept it for what it is”. 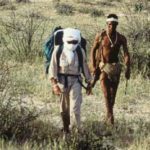 On April the 11th she left the small Bushmen’s village with the hunter and bushman Kase, and began the crossing from a small town by Charles Hill in Botswana called Mamuno only with a backpack weighting 18 kilos. 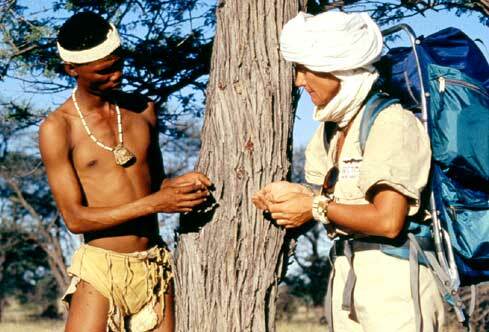 She only carried seven litters of water and a hand full of dry gazelle meat, called biltong, which is used by the Bushmen during their hunting trips. 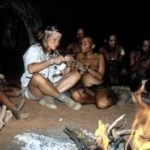 For the entire duration of the challenge she had to feed only on what she found in the desert, without using any kind of energy food. It was the duty of Kase, her walking partner, to show her what is edible and where to find the water. In her back pack she carried: tent and sleeping bag, a first aid kit which include a manual venom pump, a radio, GPS, night vision, a photo camera and a small video camera. 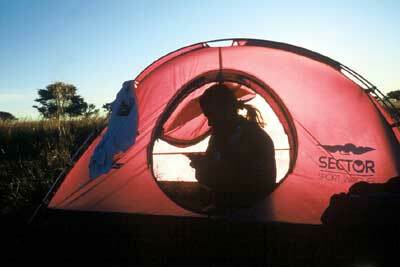 She walked in the southeast direction for 350 kilometers in 15 days feeding only on berries, nuts and resin. The radio contact with the base camp, which was guided as always by her husband, which was situated several miles away, with two off road vehicles, was interrupted after 10 days because of low radio battery.The temperature went from 40 degrees in the day to 5 degrees at night. 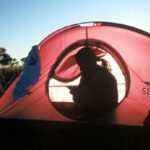 Every night Carla found shelter in the ultra light tent built especially for the challenge, while Kase slept cuddled up by the fire they kept lit all night to keep animals away. 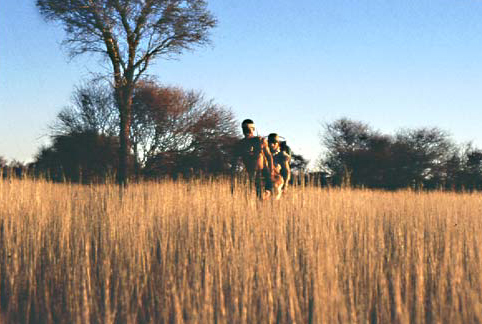 Walking in the day was exhausting: they marched between bushes covered with thorns and tall dry grass that hide all sort of danger, especially snakes and scorpions that make their homes in the grass. The climate was more humid in respect to the other deserts and Carla was constantly wet with sweat that covered her skin. 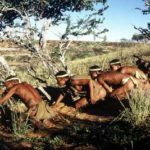 During the hottest hours they were forced to stop and find shelter under some spiny acacia trees in order not to lose too much fluid. The water supply was almost empty and the thirst drama began. Even the ostrich egg shells that Kase used as water containers were empty and there was no sign of water. …”I was able to control hunger, fatigue and pain, but I can’t find the way to control Thirst…. My tongue became thick and swelled, it seamed I had sand paper in my mouth and I tried to make some drop of saliva but it was useless.” I keep telling myself out loud that the real champion is the one who knows how to lose and decided that if we wouldn’t find water the next morning I would quit”. Almost as a miracle, the next day they arrived in a small village where they could refill their water supply. For Carla this was the signal that the desert is not her enemy but wants to help her to continue, just as the Bushmen told her. They also didn’t have any problems with the animals:”respect them and you will be respected”. 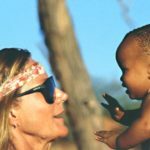 Two days from the end of the challenge, Kase left her and went back to his village: They were going out of the bushmen’s territory and Kase, who is shy and reserved, didn’t want to be around foreign territory. She went alone and without the radio contact. On April 25, Carla arrived in Lehututu the place that was establish for her encounter with the support team and the challenge ended…She was exhausted and had lost five kilos, but she successfully completed her challenge. 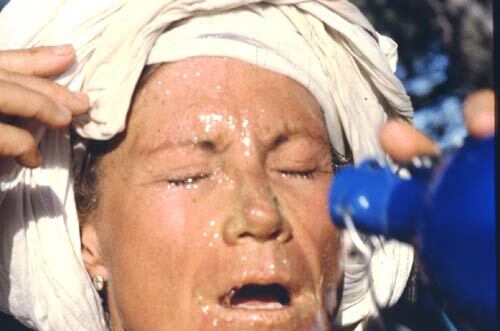 Her husband Oscar gave her a water canteen and while she was drinking it poured the water all over her face and on the Tuareg turban: The nightmare of the thirst was over.